Founded 70 years ago in Vigevano, Italy, ATOM Group have grown in to a leading brand and meta-national in the world of footwear manufacturing. They are world leader in the manufacturing of shoe machinery and industrial cutting machines. ATOMLab is the research and innovation business unit. Created in 2013, its task is to support the customers of the Group in both product and process joint innovation programs. We are all familiar with the concept of multinational companies as being big conglomerates with headquarters in one country, subsidiaries and branch offices all of over the world and thousands of employees. Yet the history of the ATOM Group is somewhat different. Founded 70 years ago in Vigevano, Italy, the company has, over the years, produced some of the most widely used families of machines for producing footwear. Machines such as its cutting presses became so popular that in countries such as India, ‘ATOM’ became the generic name for this type of machine. However, if we consider the size of the company and the niche market (shoe machines) in which it operates, it is hard to regard it as being a true multinational. 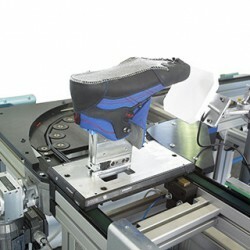 One design and development site in the UK for software (Shoe master International). Branch and sale offices all over Europe, Asia and the Americas. Although the company has its headquarters in the old shoe-making centre of Vigevano, its boundaries are neither in the city, nor in Italy itself. Its true operational perimeter is the entire world or, perhaps more precisely, “the world of shoe manufacturing”. ATOM is a company with no real borders but a perimeter that is progressively and flexibly defined by the market. By adopting this global scope and by entering a variety of different geographical and industrial markets over the years, the company actually absorbed all their individualities with a cross fertilisation approach between sectors and technologies that has made it what we may call a meta-national. A step in this evolution into a true meta-national was in 2013 the opening of ATOMLab, a Research and Innovation unit with the mission to work on the most leading-edge technologies and develop and test new system concepts that the group can then adopt. It has its own research facilities and it works in cooperation with the innovation teams of the Group’s most important international clients as well as prestigious universities and research institutions in Italy and abroad. The Lab has a set of very clear strategic goals, the first of which is to maintain and increase technological leadership in the Group’s existing cutting, lasting and injection moulding products. This requires constant monitoring of important technological trends, seeking out emerging ones and the ability to transfer innovations into the daily development flow of the company. Its evolution from being a mono phase specialist (cutting) into a multi phase supplier of technologies is forcing the Group to evolve more and more from a simple machine supplier to a process and efficiency supplier. In order to succeed in that, knowledge gaps must be filled where the existing R&D teams have no direct expertise. ATOMLab’s does this by close collaboration with customers’ innovation teams in a new form of innovation management partnership. This acts as a bridge between customers’ research teams and the Group R&D staff, expanding the horizon of intervention beyond the competence domains of the specific business units of the Group and more towards applied research. To achieve this, appropriate staff are needed. 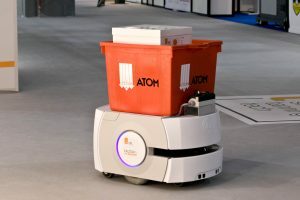 ATOMLab relies on a team of dedicated researchers, all university graduates with specialisations in process automation and robotics, material science (polymers), electronics and computer science. These are supported by a mix of junior researchers coming from local universities and senior professionals to provide the best-balanced mix between updated knowledge and experience. Besides the internal team, ATOMLab relies on its supporting external ecosystem. This a number of qualified partners including machine providers, last makers, mould makers and material suppliers that complete the value offering of the Group, with ATOMLab working as the hub. On the research side, the internal capabilities of the team are expanded and complemented by collaborations with universities such the University of Pavia (computer science and artificial vision) and the Polytechnic of Milan (RFiD competence centre). This cooperation with academia is a fundamental block in ATOMLab’s strategy as an effective cross fertilization approach between public and private research, formalized in different ways such as the issuing of research contracts on specific topics or the financing of PhD grants. As an example, at the moment ATOM is providing the budget for a three-year research of a PhD student on the interesting topic of human locomotion energy harvesting. 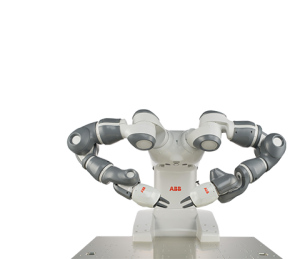 ATOMLab’s team has been very active in research in various domains, such as human robot interaction using the most recent generations of cooperative robots, advanced robotic manufacturing, computer vision, RFID tagging as the most advanced technology to track and monitor components in the manufacturing process, augmented reality for industrial applications, Internet of Things, plus 3D printing and additive manufacturing, focusing on the disruptive potential they may have on products and their manufacturing processes. 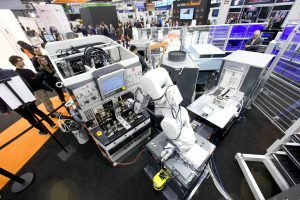 ATOMLab researches the full range of technologies that are part of the so-called 4th industrial revolution, Industry 4.0. ATOMLab does not only focus on technology and research. The way in which technology providers approach their customers is changing. There is a need to establish new kinds of relationships, based on novel concepts such as the emerging servitization paradigm. Servitization is often viewed as the way in which companies provide an integrated bundle of both goods and services or add extra service components (value) to their core offering. A broader definition still, is that servitization is the innovation of an organisation’s capabilities and processes to better create mutual value through a shift from selling products to selling product service solutions. For example, in the aerospace industry, the engine manufacturer Rolls Royce no longer sells an engine to aircraft producers. Instead, it supplies a bundle of operating hours, performance monitoring and maintenance, shifting the competitive challenge from pure product/price to long lasting relationships, quality and performance based on an integrated service. Similarly, in the automotive sector, Mercedes Benz offers a service called Car2Go in which the company, instead of just selling a car, offers a ‘mobility service’ where it bundles in a full package of attractive offers to its clients and supported by an APP to locate the nearest ‘mobility device’. It effectively replaces the burden of property with a wealth of services that relieve the driver from the complications of ownership and that focus on the car’s true function; mobility. The world is changing at a bewildering speed, both socially and economically. Behind it all lie developments in modern technology which appear to have no limit. The way we create products and services bears no resemblance to 50 or even 25 years ago. And now, the traditional boundaries between these two are becoming blurred. Companies grew into multi-nationals, adapted further with globalisation to become meta-nationals and some are now developing a stage further to become servitizers. ATOMLab is in all respects, the experimental facility that will eventually accomplish the ultimate evolution of the ATOM Group from national company, through meta-national to a servitizer for the footwear industry. The factory of the future will be more and more distributed, digital and automated but without loosing its human touch through the high value product contents and the skill of its workers.